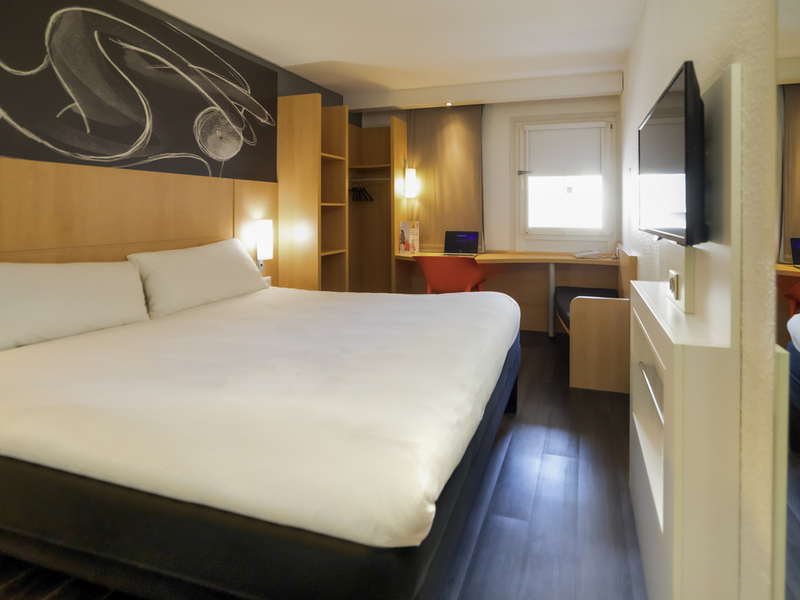 The entire team at the ibis Grenoble Centre Bastille welcomes you to Grenoble. Discover the Bastille, just a stone's throw from the hotel, and enjoy breathtaking views of the city and mountains. Access by cable car or on foot for the more courageous. Let us give you a warm, friendly welcome and take care of your every need. Enjoy a lovely glass of wine, a nice beer or even a Coca-Cola with a hot or cold snack, or even just chips or peanuts depending on what you feel like! The bed was not very comfortable and was creaky, which made sleeping difficult. The shower was small and the curtain blew in so it stuck to your back when the shower was on. It would have been nice to have a kettle in the room. Easy access, enough comfortable rooms to spend 1-2 nights for business trip, good breakfast. The roomI was assigned was at a much lower level than expected from the website (smaller, dirtier, older ...). I entered the room and it smelled of cigarettes. When I opened the bathroom door, it was like someone was smoking in the toilet. After 10 minutes my throat hurt. I was luckily assigned a new room, but the whole floor had a strange smell anyway. I am considering to officially complain. The room was very tiny and cold! The bed was broken! The parking garage was so stupidly narrow that I had to scratch my car!!! There was a power cut and no WiFi for a day! The staff can’t speak English! What a rubbish hotel! And stop sending me these surveys every day or I’ll leave the most worst feedback on Tripadvisor!!!! Good location but very small and dirty room. We family of 3 been staying here for few nights and I was surprised how small rooms are. Our 308 room was absolutely little with small window looking at the back of building and without even room for two small luaguage. Also so dirty!!! Never seen more dusty rooms. We found even someone’s underwear under the bed I’m not talking about piles of dust! It looked like room wasn’t been cleaned for month. Breakfast was very basic and cold so we cancelled it. Reception guy was absolutely lovely and very friendly. Location is good too. Room smelled of cigarette smoke and was very cold but breakfast was great & good cafes were nearby. Very friendly and helpful staff but our room smelled of cigarette smoke and the room was cold so heating needed to be turned on. Room was quiet and shower had great pressure and plenty of hot water. The breakfast was wonderful and there was plenty with great tasting coffee.Plenty of first class dining spots were nearby. Great location. Bad cleaning services. Small rooms. Nice front desk personnel. Lovely short stay to see Grenoble in Winter. The hotel is very well located within the city centre. Great to be able walk around visiting the Christmas markets & cultural sights. Friendly & help staff made stay enjoyable. Will visit again. Nice hotel in the city centre. Very essential but comfortable room. A socket on both sides of the bed would be appreciated. Cleanliness was ok, although under the bed there was quite a lot of dust (we realized only when we pulled out our bags before leaving). Convenient parking (extra). Breakfast with a limited choice, but the quality is good. The staff is friendly, although we received quite a lot of pressure for being a few minutes late at the check-out, which seemed exaggerate considering that it was Sunday in the low season. Professional and attentive staff, who go out of their way to provide the feeling of being at home. Very professional, friendly and helpful staff, room fine. Everything I needed, excellent location, helpful staff. Located at the center of town. It’s convenient to go everywhere.